I love great parties and social events. There is something about them which I find so fascinating, whether it’s how people interact with one another or what people or wearing. There is so much going on at these events that for someone with an interest in the psychology of such events, it is a veritable playground. And here in Staines, there are plenty of occasions held by the twenty four thousand people who work here to keep people like me happy….though I suspect that most people who attend these events are simply hoping to have a great time. You can’t blame them. But what are events in Staines like these days? Go back a few years and it was almost certain that a typical function or special occasion would also signal the usual (and awful) catering suspects being wheeled out. You know the sort of things I mean; cold meats, tasteless sausage rolls and distinctly unappealing looking sandwiches. These are the catering options that have blighted many an event for decades, and not just here but across the United Kingdom. Thankfully it seems that the hog roast hire Staines chef has come to rescue us all and seems to be doing a very job indeed. Taste the Cracklin hog roast in Staines are fantastic, in fact they are everything that a great special occasion caterer should be. Forget the terrible food of the past because hog roast has confined the stories of terrible event catering to the annals of history. This is real quality food. Hog roast was itself a bit of ancient history until its new found catering fame. It is a medieval dish that was cooked over a roaring fire and enjoyed by the slightly more affluent members of society. But it seemed to disappear off the face of the planet for decades, only making the occasional appearance here and there…but now a Taste the Cracklin hog roast can often be seen at events in and around the town serving great tasting meat to the good folk of this town. So what is that makes a Taste the Cracklin event a great event. 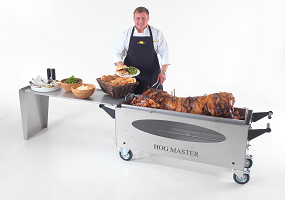 Well, hog roast is one of the very best tasting meats you can get and for catering events where you need plenty of meat to go around, it is simply unbeatable. One of the most important factors that makes it so tasty is that it is a freshly cooked meal. No warming up or taking out of the freezer, it is cooked from scratch, meaning you and your guests get to benefit from the great tastes of truly freshly cooked meat, and as everyone will tell you, freshly cooked is always the best! Of course, the meat is only any good if it is good quality and that is another area where hog roast excels, because the Taste the Cracklin chef will only ever choose a good quality, locally sourced pig for any event they cater for. It’s that sort of level of dedication that you wouldn’t normally associate with a special occasion….but this is not normal, this is hog roast and that means special! Of course, parties and special occasions are a little like the guests that attend them; they come in all shapes and sizes, and it is equally flexible when you need to cater for such events. You see, the Taste the Cracklin hog roast caterer knows that some events such as birthdays, Christenings and student events like nothing better than nice free and easy catering, which makes hog roast rolls simply perfect for such occasions. Lots of delicious, freshly cooked meat on a bap with crackling and apple sauce is quite frankly unbeatable at events like this. But if the event is something that requires a little more Staines decorum, you cannot go wrong with the gourmet hog roast meal that the chef can magic up for you. It looks incredible and tastes divine. You might also be attracted to hog roast because it really cuts an impressive sight when you walk into a venue and see a full whole pig being slowly roasted away. It adds a real sense of extravagance to your occasion…and that’s before anyone has even tasted the magic meat! If you are starting to make plans for your next big Staines occasion then Taste the Cracklin really should be the first thing you write down on your to do list as it offers everything you could possibly want. As a Staines hog roast caterer, Taste the Cracklin can be the magic ingredient.